This is a rad anthology based on the website of the same name, a vibrant collection of submissions by Seattleites past and present about the places, things, and vibes that defined them and the city outside of the mainstream, which are slowly vanishing. Told perfectly in a DIY/zine style with nostalgic and poignant text, drawings, photos, and cartoons, it details the physical, emotional, and spiritual institutions that have represented much of the soul of weird Seattle over the past several decades. This anthology pays tribute to and preserves the eccentric, funky, and ever-resistant spirit of Seattle. This gorgeous book from Seattle's Chin Music Press brings together essays, comics, maps, poetry, and illustration to explore and remember the places, people, and history that made Seattle what it was and is. 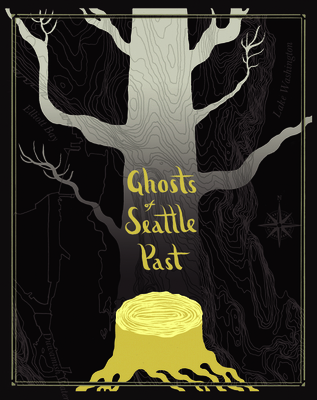 A highly moving and intensely personal account of loss and change in our city, Ghosts of Seattle Past can provide both native and new Seattleites with a sense of history that becomes ever more important as Seattle undergoes rapid growth and change. Seattle is built on booms--logging, fishing, aerospace, and now tech. This anthology gathers essays, interviews, photography, and comix to reconstruct community hubs lost to growth. From the settlements of Native American tribes to the incubators of grunge, from a foxxxy cabaret to an Old Spaghetti Factory, Ghosts of Seattle Past provides an eyes-on-the-street view of a city in flux. The Ghosts of Seattle Past anthology comes at a critical point: Seattle had the country's steepest rent hikes in 2015. The city is becoming a national focal point for issues of development. Both recent transplants and the old guard are trying to figure out how to live in the new landscape. Through their warm, conversational, whip-smart voices, the city speaks not only to the current boom, but also to longer-brewing problems of segregation, queer erasure, and colonization. Tracing the issues across six hand-drawn maps, Seattle's best-known artists (including Elissa Washuta, Kate Lebo, and Paul Constant) join community lynchpins (including Chief Seattle's great-great-great-great grandson) in a dialogue as incisively political as it is richly human. Anthology curator Jaimee Garbacik is a book editor, writer, artist, youth equity advocate, and the owner and founder of Footnote Editorial. She previously authored Gender and Sexuality for Beginners, currently on curricula at more than a dozen universities. Josh Powell, artist behind the anthology's hand-drawn maps, is the former director of all-ages youth-led music and arts organization The Vera Project and co-founder of Seattle nonprofit The Bikery. He currently works at Seattle's largest environmental remediation firm. Jaimee Garbacik is a book editor, writer, artist, former programming chair of The Vera Project, and the owner and founder of Footnote Editorial. She previously wrote Gender and Sexuality For Beginners, currently on curricula at more than a dozen universities. Josh Powell is the former director of the all-ages youth-led music and arts organization The Vera Project and co-founder of nonprofit The Bikery. Josh is currently at Seattle's largest environmental remediation firm, clandestinely investigating how we might one day employ fungi in cleaning up oil and hazardous material spills. He is also designing a board game about mushrooms called Champ.